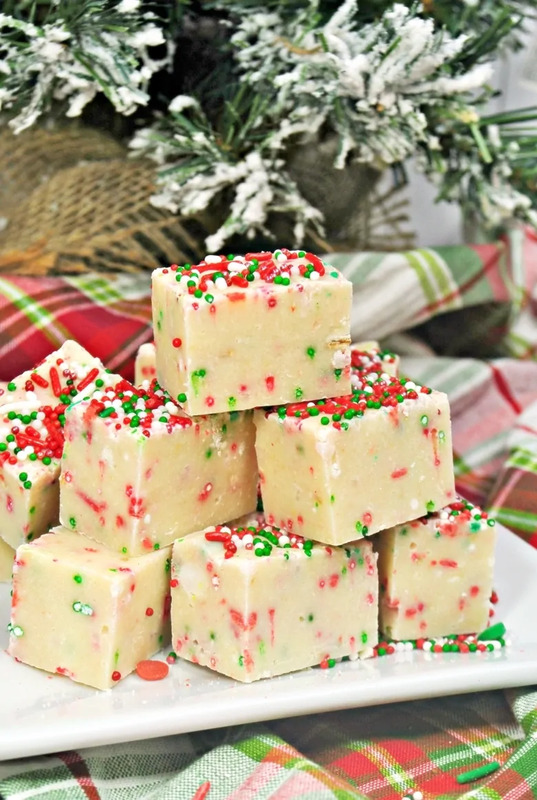 Sugar Cookie Christmas Fudge Recipe - Only 4 Ingredients! Do you love sugar cookies? What about fudge? In my world, sugar cookies are pretty much the best thing ever. Especially ones with sprinkles on top! Sweet, chewy, buttery goodness. Mmmmm… so good! 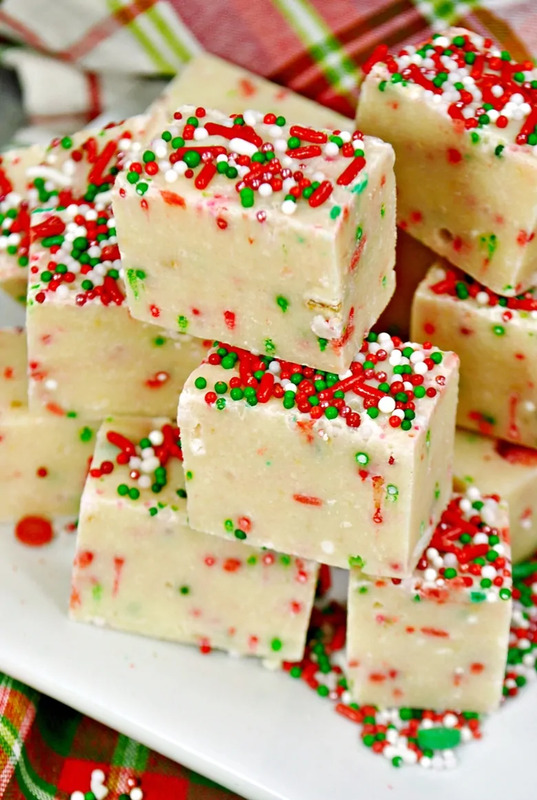 So, I thought what better treat to make this Christmas than a sugar cookie flavored fudge? 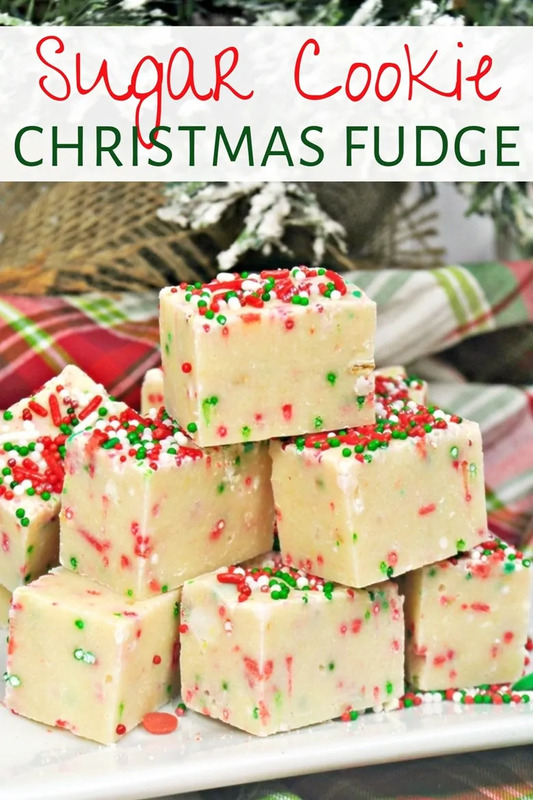 If you love Christmas sugar cookies like I do, you are going to go crazy for this sugar cookie flavored fudge. This holiday fudge taste amazing and is super easy to make too. 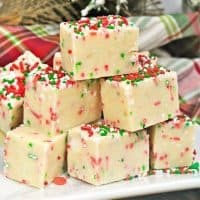 So, make a batch of sugar cookie Christmas fudge for your family this holiday season and see for yourself how delicious it tastes. Or, spread some holiday cheer around your office or neighborhood with a batch of Christmas fudge. 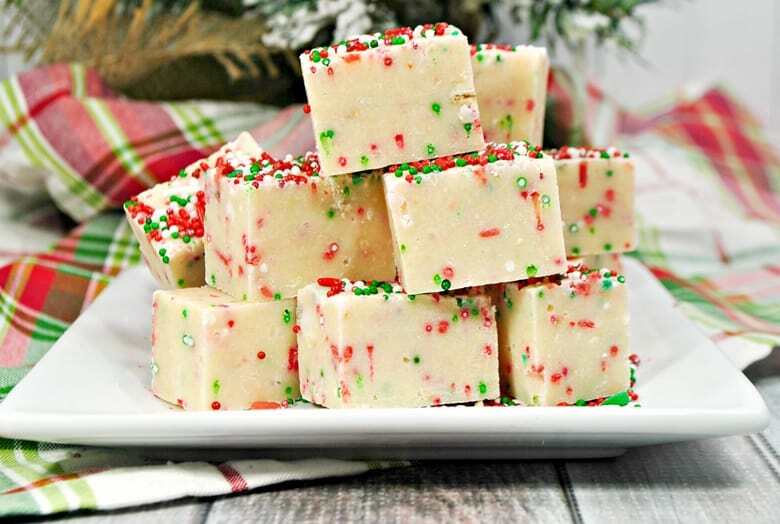 Whatever you do, one thing is for sure — this Christmas sugar cookie fudge will have everyone coming back for “just one more piece”. Start by gathering everything that you will need, which will be simple since this fudge recipe only calls for 4 ingredients. Now it is time to get down to business. Line a 9×9 baking dish with parchment paper and a thin layer of non-stick spray and set aside. The parchment paper and non-stick spray will help you remove the fudge easily once it has set. Next, combine white chocolate chips, sugar cookie mix, and sweetened condensed milk in a large pot. Melt over medium heat, stirring frequently until smooth. Once the mixture is smooth, stir in some sprinkles (we used about 1/2 cup). Finally, pour fudge mixture into your prepared baking dish and then top with lots more sprinkles. Place in refrigerator and allow to set overnight, or until firm (at least 2 hours). Slice and serve. I hope that your family enjoys this sweet holiday treat and has a very Merry Christmas! Prepare a 9×9 baking dish with parchment paper and a thin layer of non-stick spray. Set aside. 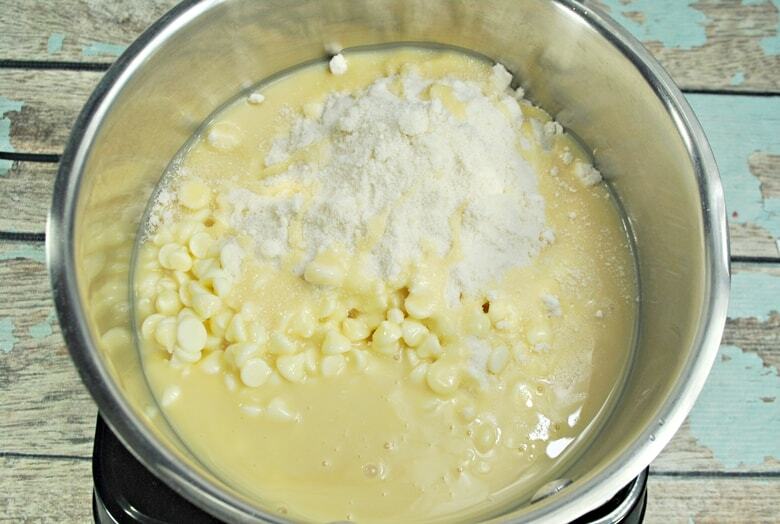 Add white chocolate chips, sugar cookie mix, and sweetened condensed milk to a large pot. Melt over medium heat, stirring frequently until smooth. 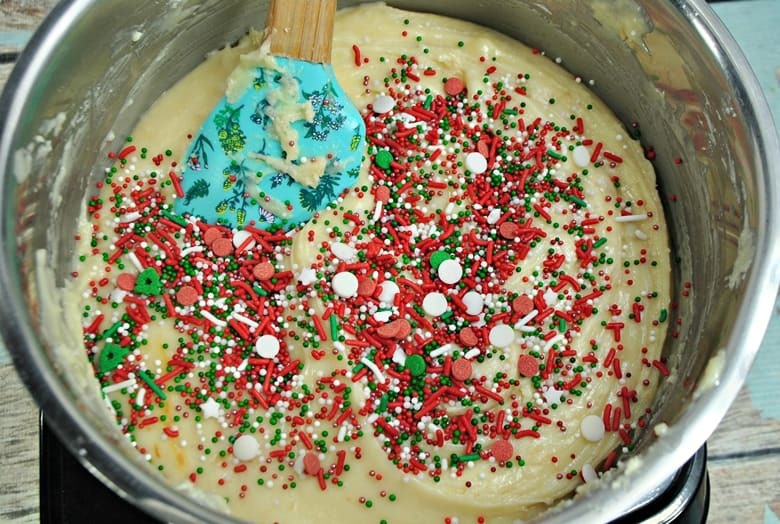 Once mixture has melted, add about 1/2 a cup of Christmas sprinkles. Pour fudge mixture into the prepared dish and top with more sprinkles. Place in refrigerator and allow to set overnight, or until firm (at least 2 hours). Slice into bite size pieces and serve. Wow, that’s a lot easier than I ever would have thought! This fudge looks seriously amazing. 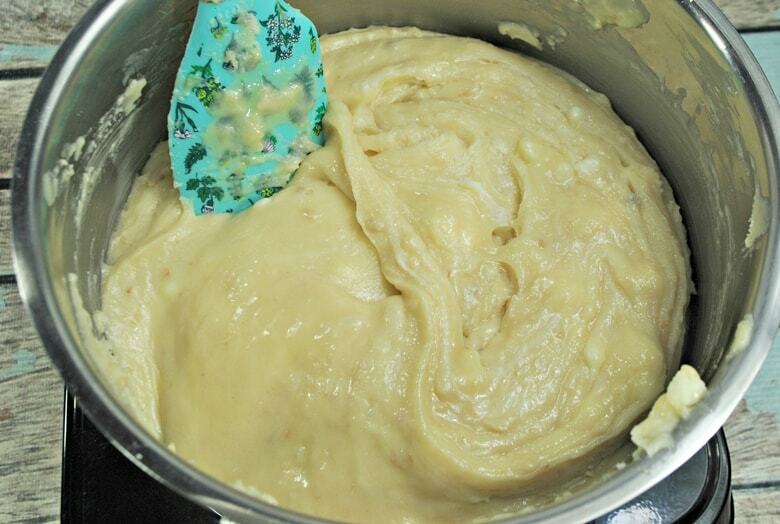 Mine became a dough….can’t even mix in the candy. Have to throw it out. 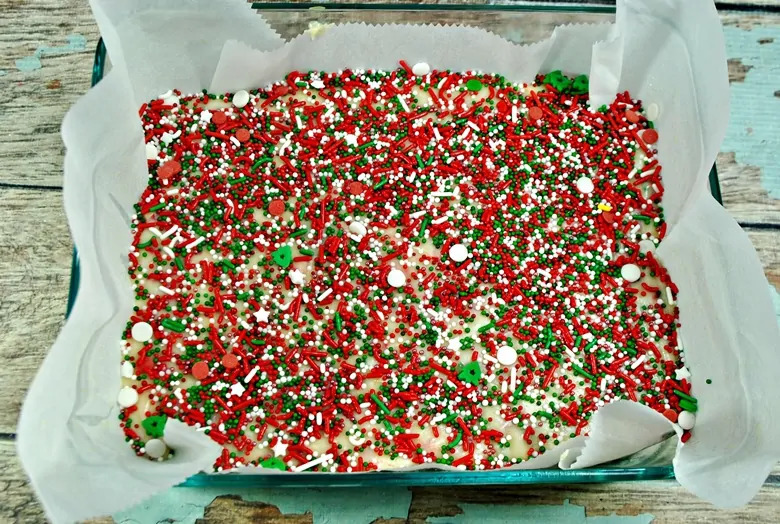 This sugar cookie fudge IS much more firm and dense than a typical fudge, but it shouldn’t be so hard that you can’t mix the sprinkles in. Great recipe! I started on a double boiler but ended up placing it a kettle on the stove-top. Eventually is became smooth and turned out as described. Anxious for the holiday party tomorrow night! How far in advance can I make this? Looking for easy recipes that can be frozen until needed or will be 4 before event. Are they best stored in fridge or airtight on counter? Looking forward to hearing from you very soon.